To be a Sponsor, We would love your help to spread awareness all over Second Life on our mission to promote love and marriage equality in the world. We welcome any ideas you may have in promoting this awareness project. It can be a unique outfit or item you’ve made for STAND4Love, an event or show to promote STAND4LOVE, an article in your blog/magazine, etc… Anything you want to do would be awesome. PLEASE DO NOT CHARGE FOR THE ITEMS YOU MAKE OR EVENTS YOU PRODUCE. All items must be FREE or only 1L at most. We are NON-PROFIT. In return, we will put you as a sponsor and promote/support your events and business. We do not accept money or donations. We are strictly non-profit. 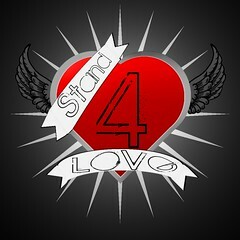 In addition, any help you can give to promote STAND4LOVE through Second Life Group Notices, Blogs, Facebook, Twitter, Plurk, Flickr and other Social Networking Sites as well as your store fronts are greatly appreciated. Thank you so much in advance. Please contact RicoRacer Flux or Stand4Love Resident (Inworld) or Email Stand4Love27@yahoo.com if you are interested.